THE VOTE: Liverpool fans, do you want to sign Gabriel Heinze? 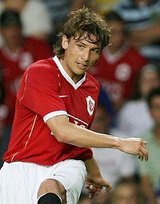 Rafa Benitez seems rather keen on bringing Argentine left-back Gabriel Heinze to Anfield. All well and good – Heinze is a quality defender who always gives his best. One small problem though: he currently plays for Man Utd and traditionally Liverpool and Man Utd don’t tend to buy players from each other. It’s a hate thing. Which begs the question, aimed at Pool fans: would you be happy to welcome a Red Devil to Anfield this summer? Those options are a bit limiting.